Straight from the Arctic to your screen, here's the laziest polar bear ever recorded. Check out this funny polar bear doing a handstand and his hind paw sticking out of the water. Visit oneworldoneocean.org for more Arctic videos and learn why we should protect this pristine environment and its inhabitants. NOAA’s National Weather Service and the National Safe Boating Council (NSBC) have partnered again to encourage recreational boaters to know their risks, learn the rules, and be prepared before taking the helm this summer during National Safe Boating Week: (May 19 to 25). According to the U.S. Coast Guard, there were more than 4,000 boating accidents, including 758 deaths, in 2011. Seventy percent of all fatal boating accident victims drowned, and of those, 84 percent were reported as not wearing a life jacket. Once in the water hypothermia can become a significant threat to survival even if wearing a life jacket. To increase awareness about the dangers of hypothermia, the NSBC and NOAA have enlisted assistance from former college football player and boating tragedy survivor Nick Schuyler. Schuyler was the lone survivor of a boating accident while fishing off the Florida Gulf coast in February 2009. Interviews with Schuyler are available online and provide lifesaving information about hypothermia as well as the importance of being prepared. “Before going out on the water, check the marine weather forecast and then stay informed with a NOAA Weather Radio,” said Jack Hayes Ph.D., director, National Weather Service. NOAA and the NSBC have launched a series of boating safety public service announcements to highlight important boating safety topics, including hypothermia; the importance of always wearing a life jacket; distress radio beacons; winds and waves, thunderstorm safety; understanding your marine forecast; and boating under the influence. This Inflatable Life Jacket Educational vieo is an educational approach to educating boaters about inflatable life jackets. The NSBC administers the North American Safe Boating Campaign “Wear It!” designed to educate boaters about the importance of life jacket wear while introducing them to the different styles that are available, including inflatable life jackets. “Wear It!” is produced under a grant from the Sports Fish Restoration and Boating Trust Fund, administered by the U.S. Coast Guard. “Lives can be saved by improving the knowledge and skills of recreational boaters,” said Virgil Chambers, executive director, NSBC. Know your risk: Have an understanding of the body of water you want to boat in. Learn the rules of boating before taking the helm by taking a safe boating course. Check the marine weather forecast before going out on the water. The weather can change quickly, so plan for all types of weather hazards. Be prepared: Make sure your vessel has the required equipment such as life jackets, a first aid kit, and distress signals. Develop an emergency plan with more than one way to get your boat out of trouble. Create a float plan and tell a friend of your whereabouts and when you plan to return. Obtain and pay attention to NOAA Weather Radio and understand marine watches, warnings and advisories. Be an example: Share with your friends, family, co-workers, and your social media network safe boating tips, such as the importance of wearing a life jacket and taking a safe boating course. The information you share might just save their lives, too. NOAA, through its National Weather Service, is dedicated to supplying the most up-to-date and accurate weather information throughout the U.S. coast, coastal and offshore waters, the Great Lakes, and the open oceans. NOAA’s National Ocean Service provides the navigation services that protect lives, strengthen the maritime economy, and position America for the future. Download NOAA’s free nautical charts BookletCharts today. The National Safe Boating Council (NSBC) is the foremost coalition for the advancement and promotion of safer boating through education, outreach, and training. The NSBC accomplishes this mission by promoting outreach and research initiatives that support boating education and safety awareness; improving the professional development of boating safety educators through training; and developing and recognizing outstanding boating safety programs. More information about the NSBC and its programs, is available online. Join NOAA on Facebook , Twitter and our other social media channels. Gravity field over the Pacific Ocean’s Emperor Seamounts based on CryoSat, ERS and Geosat satellite altimeter measurements of ocean-surface height. At this scale, the gravity field of the ocean reflects seafloor topography, called bathymetry. The improved radar measurements from CryoSat will be used to improve bathymetry. 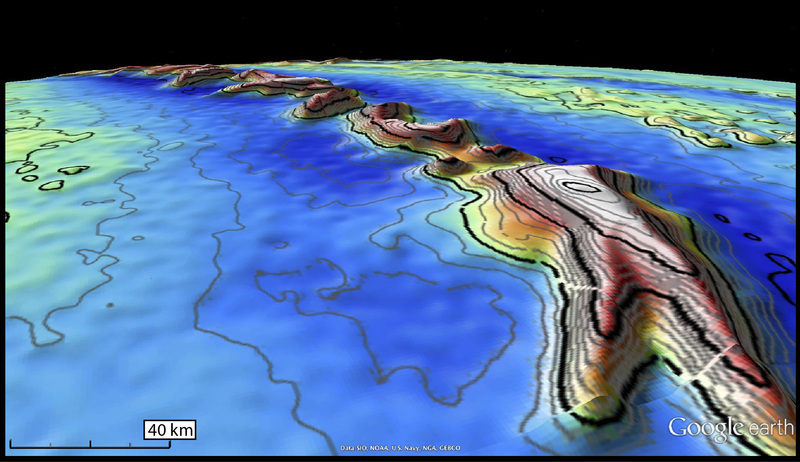 The measurements will be used in the next generation of the seafloor maps in Google Earth. CryoSat was launched in 2010 to measure sea-ice thickness in the Arctic, but data from the Earth-observing satellite have also been exploited for other studies. High-resolution mapping of the topography of the ocean floor is now being added to the ice mission’s repertoire. The main objective of the polar-orbiting CryoSat is to measure the thickness of polar sea ice and monitor changes in the ice sheets that blanket Greenland and Antarctica. But the satellite’s radar altimeter is not only able to detect tiny variations in the height of the ice but it can also measure sea level. The topography of the ocean surface mimics the rises and dips of the ocean floor due to the gravitational pull. 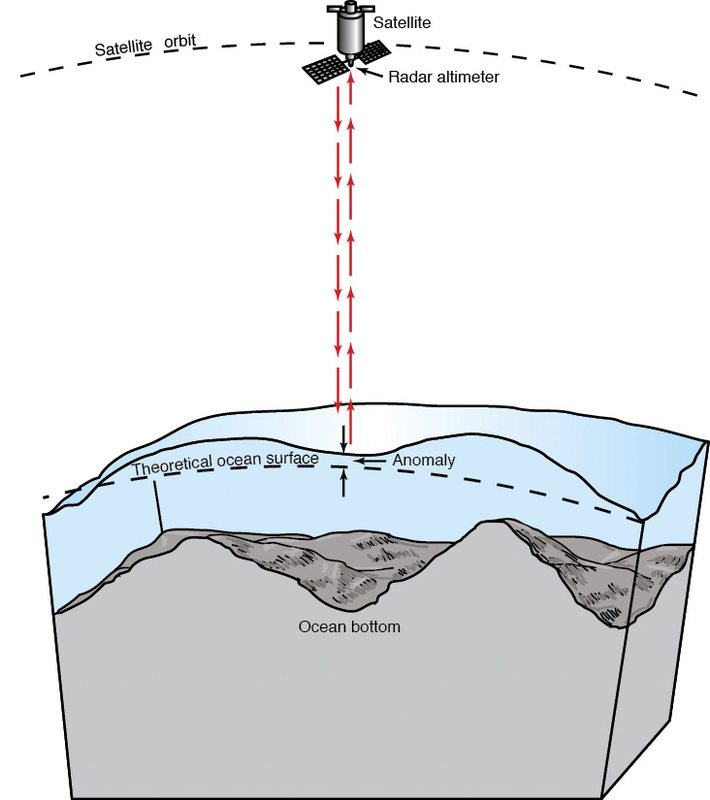 An Earth-orbiting radar cannot see the ocean floor, but it can measure ocean-surface height variations induced by the topography of the ocean floor. The gravitational pull of the seafloor produces minor variations in ocean surface height. Seafloor mapping by ships is much more accurate than radar altimeter mapping, but to date only 10% of the seafloor has been charted this way. A complete mapping of the deep oceans using ships would take 200 ships navigating Earth, 24 hours a day, for an entire year at a cost of billions of dollars. Mapping using satellite radars can cover a larger area in a shorter amount of time. When interesting features are discovered in satellite measurements, they can later be surveyed in fine detail by ships. Areas of greater mass, such as underwater mountains, have a stronger pull, attracting more water and producing a minor increase in ocean-surface height. Therefore, instruments that measure sea-surface height incidentally map the ocean floor in previously uncharted areas. There have been several recent global gravity missions, such as ESA’s GOCE satellite, that provide extraordinarily accurate measurements of gravity at the spatial resolution of hundreds of kilometres. CryoSat determines variations in the thickness of floating sea-ice so that seasonal and interannual variations can be detected. The satellite also surveys the surface of continental ice sheets to detect small elevation changes. Information on precise variations in ice thickness will further our understanding of the relationship between ice and climate change. But CryoSat’s radar altimeter can sense the gravity field at the ocean surface, so that seafloor characteristics at scales of 5–10 km are revealed. This is the first altimeter in 15 years to map the global marine gravity field at such a high spatial resolution. Recent studies at the Scripps Institution of Oceanography in San Diego, USA, found that the range precision of CryoSat is at least 1.4 times better than the US's Geosat or ESA's ERS-1. They estimate that this improved range precision combined with three or more years of ocean mapping will result in global seafloor topography – bathymetry – that is 2–4 times more accurate than measurements currently available. “We know more about the surfaces of Venus and Mars than we do about the bathymetry of deep oceans,” said David Sandwell from the Scripps Institution of Oceanography in the US. Most satellite radar altimeters such as the one on the joint CNES/NASA/Eumetsat/NOAA Jason-2 follow repeated ground-tracks every 10 days to monitor the changes in ocean topography associated with ocean currents and tides. CryoSat’s 369-day repeat cycle provides a dense mapping of the global ocean surface at a track spacing of over 4 km. Three to four years of data from CryoSat can be averaged to reduce the ‘noise’ due to currents and tides and better chart the permanent topography related to marine gravity. This morning some electrical incident occurred on our servers : one of our main servers crash in our datacentre. This outage only affects the display of the US NOAA and Canada CHS layers on our website and on the 'Marine US' iPhone/iPad app. We're very sorry for any inconvenience caused. It will take about one week to fully restore the service for displaying these two North American layers again. The last fisherman : who's got their hands on all our fish? An overhaul of the law that governs fishing in Europe only happens every 10 years, so we need to make sure that this time, it works. We want a Common Fisheries Policy (CFP) that supports sustainable fishing, ends discards and puts the health of our seas first. Greenpeace has spent a lot of time lately on wharves, docks, piers and beaches. The story we're hearing is the same the coast long; the UK's low-impact, small-scale fishing industry is on its last legs. These fishermen, most of whom are part of the inshore under-10-metre fleet, tend to land high quality fish, using methods that do little or no damage to the local environment. Quite the contrary: despite comprising 77% of the active UK fleet, they have access to only 4% of the country's quota. So who's got their hands on all our fish? (It's worth remembering they are our indeed our fish; they're a public asset, a common resource). No one really knows who holds UK quota, but what we do know is that the answer mostly involves those with the most economic clout and ability to throw their weight around. In a gradual process bordering on privatisation by stealth, the resource of the many has fallen into the hands of a few. As the long-time Hastings fisherman John Griffin puts it: "It's definitely the 'greener' side of the industry that's suffering. We're as morally correct as we can be, we don't hide anything and we try to be as green as possible; we're doing our best but we're the ones being pushed out." Which brings us to an unprecedented alliance between UK fishermen and Greenpeace. Today we're launching a campaign called Be a Fisherman's Friend, to save the UK's struggling inshore fleet, and thereby protect our fish. It's a common myth that Greenpeace is anti- fishing; we just want fishing rights to be given to those who fish in the right way. Most people are aware the system's broken. In fact railing against the EU's Common Fisheries Policy (CFP) is a British political ritual, conducted in language as familiar as the Lord's Prayer or the football results. So well-worn is this tale that it's rare for anyone to even question its basic veracity, or to ask why, if it's so broken, successive fishing ministers have done so little to fix it? Yet if we cannot find an answer to this question, we will continue to be hamstrung by a policy that's trashing our oceans and failing our fishermen. A reform of the CFP, currently underway in Brussels, provides a once-in-a decade opportunity to alter things so that the system rewards those fishing sustainably. But let's go back. How did we get to the point where EU fisheries policy allows a tiny number of high-impact operators to dominate how we manage our oceans and fish stocks, despite their fishing methods being so destructive? "Efficiencies" in fishing have been progressing at the rate of around 3% a year for decades. Ever-more powerful boats go further and faster, with ruthless and indiscriminate fishing methods, hunting down fish in hundreds of miles of ocean using sophisticated sonar systems. The inevitable result is that fish stocks decline: 72 % of European fish stocks are now depleted. If we continue to fish as we are, 91% of European fish stocks will be at unsustainable levels within the next decade. In response to the problem of "over-capacity" [read: too many factory-style boats catching too many fish], boats have had to be forcibly removed from the industry. And because the more "efficient" boats and skippers make the most money, they're often the ones who remain in the game while others are forced to leave. Fishing rights, money and influence have become increasingly concentrated in the hands of a relatively few individuals and businesses, who in turn act as a powerful and entrenched lobby for the kind of industrial scale fishing practices that maximise profit at the expense of local employment and the local environment. In the UK, this process has been exacerbated by successive governments' chronic mismanagement of the national quota allocation, which is what's left the inshore fleet with access to only 4% of quota. The UK government has also allowed those who control the lion's share of the quota to treat it as a tradable commodity. Unused quota is leased out at exorbitant prices, maximising profits for the quota "owner" at the expense of ordinary fishermen in coastal towns up and down the country. We're on our way to fishing rights being traded like subprime mortgages. Evidence shows that those who fish selectively and with least environmental impact offer the greatest benefits to the economy. One recent analysis estimated that for every tonne of cod landed, trawlers delivered negative economic value ranging from -£116 for the smallest trawlers to almost -£2,000 for the largest. Gillnets (a lower impact fishing method) in contrast generated a net +£865 of value. Yet between 2006 – 2008, trawlers landed almost 6,000 tonnes of cod, while gillnets landed less than 3% of this – just 163 tonnes. The CFP reform is an opportunity to sort out the mess. It is now up to the government to pursue reforms at home and in Brussels, which will capture the economic benefits of sustainable fishing. Giving priority access to those who use selective, low-impact methods and provide the highest levels of local employment should become the guiding principle of fisheries management. This won't be easy. Vested interests will continue to claim that "batting for Britain" is simply about grabbing a greater share of the EU pie, rather than securing a truly radical reform of EU and UK fisheries management. For the sake of our fishermen, our fish stocks and the health of our coasts and seas, this government and the fisheries minister, Richard Benyon, must take a different view. The most beautiful boat race in the world ? Skimming the surface of the sea, brilliant white sails billowing in the wind, they are a timeless image of elegance. 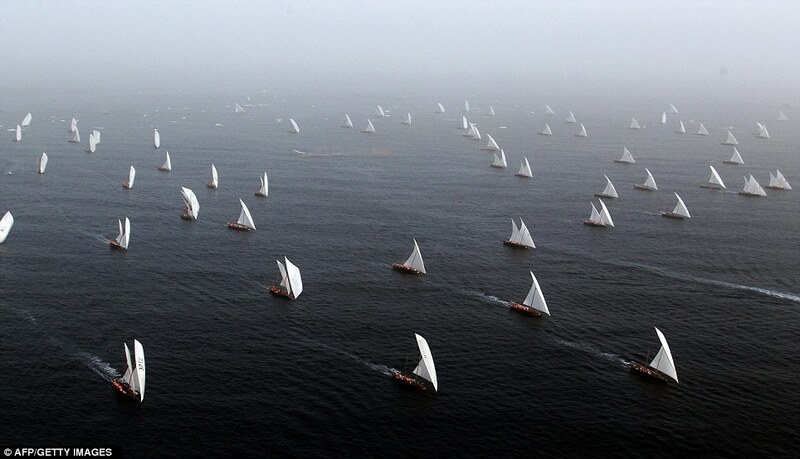 But the 99 dhows taking part in this year’s Al Gaffal race are not simply a stunning site on a beautiful day. They are also keeping alive an ancient tradition of shipbuilding which stretches back to Greek and Roman times. 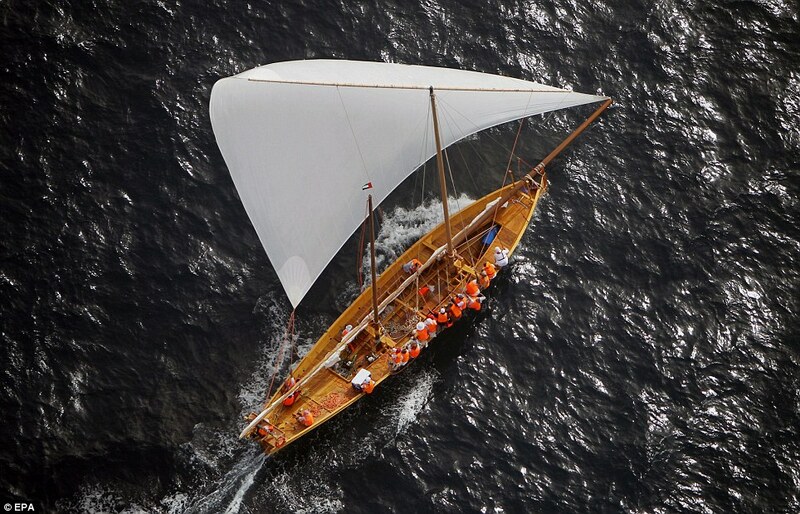 The ships – recognisable by their triangular lateen sails – were once used on the trade routes across the Indian Ocean. They are now a less common site. But the Al Gaffal allows thousands of spectators, positioned on the Dubai shore, to see them in all their glory. 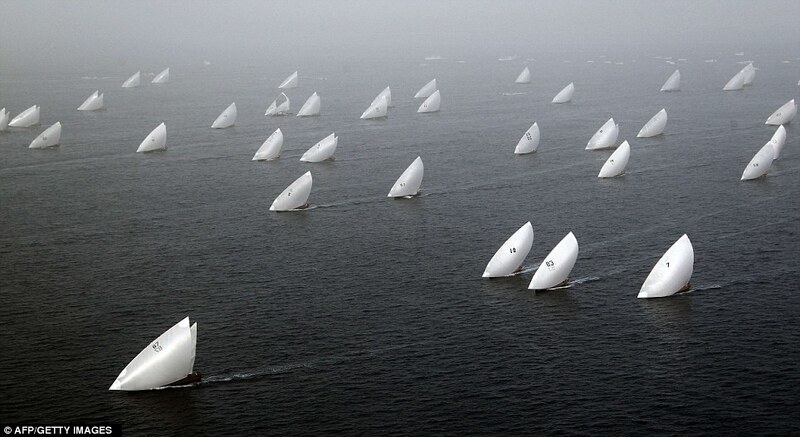 In its 22nd year, the race at Sir Bu Nair Island, near the coast of Iran, and finishes just off the emirate state’s International Marine Club. 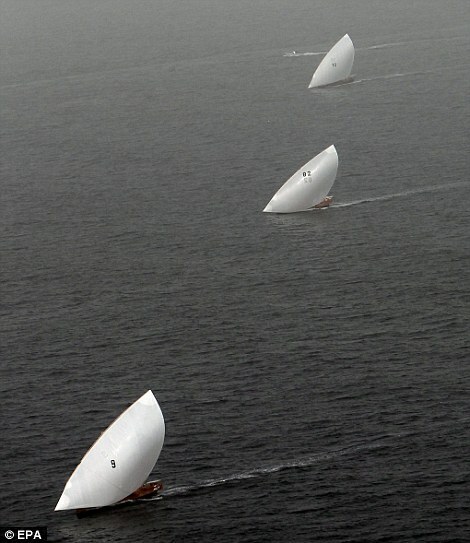 It began at 6.30am and by midday, many of the 60ft boats were crossing the finishing line. 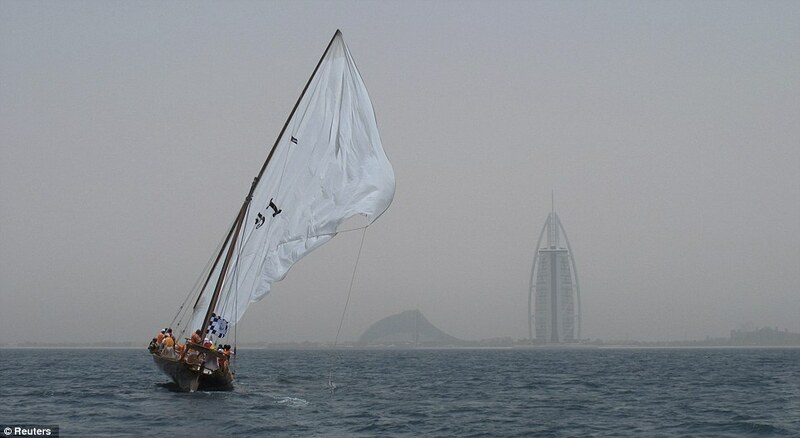 Organisers chose Sir Bu Nair as the starting point as it is where pearl divers – who were the early staple of the Dubai economy – stopped to rest on their way home from months at sea. AKA a skim board surfer, Brad Domke is a talented creature. There’s nothing like inventing a new way to ride waves so that you can be the best in the world at it. The future is always today. Surfing has been pushing the limits of technology and physical performance. Aerials have touched the skies and the street and mountain extreme sports have been inspiring surfers in their new skills. Progressive surfing is everything that leads surfing forward. From time to time, we get new footage showing us impossible is nothing. Surfers were designed to defy gravity and the laws of physics. Skurfing is a concept that has been rising in the wave riding world. There's no official meaning for the newest son of surfing. It's perfectly visible that skurfing is mix of surfing, skateboarding, skimboarding (or skimming), bodyboarding and even snowboarding. Bradley Domke is known for mastering the art of skimboarding and for trying new tricks and moves with outstanding creativity. He has been named the most progressive skimboarder on the planet. In "Brad Domke Umleashed" he guides us through what may be considered a few possible roads for the future of surfing. The present of surfing is talking about getting more and more fins in a surfboard. Brad Domke does exactly the opposite. A simple thin wave board and talent is enough and when skimboarders teach surfers, then we know we are on the right track. Aamion Goodwin, his wife Daize Shayne Goodwin, and their two young kids have begun an around-the-world adventure, which they plan to document on their website. A young family leaves their home on Kauai. It is time to return to the itinerant path from which all things in their uncommon lives come; beginning and ending on a remote dot in the Pacific. They nomadically trace continents to places where waves meet their edges, envoys of aloha. It is what they will learn, what they bring others, what they will pass on to their children in the hyper-expanded classroom, the lab of direct being; a legacy passed from a father to his family. Aamion was bare handing prawns from a clear creek in Namuamua Village, Fiji, before he could talk. His vagabond dad made home not in one place, but amid a seasonal passage to outposts in New Zealand, Kauai, and Fiji. He is as much a son of nowhere as he is comfortable everywhere. Work and play are blurred for him, and done hard especially now that he and wife Daize have added a second child, True, to the brood. Daize attracts people wherever she goes, for something more than her sunny magnetism. Whether noseriding over piercing reef or navigating a varied upbringing she got through unscathed. As a teen she was the face of Roxy, an icon in the rise of women’s surfing, and longboarding world champion twice. Through her resourceful creativity Daize has manifested a blessed life. Trolling the Hanalei farmer’s market for tasty mangoes so her kids don't crave candy, she’s a happy, purposeful mother who knows the earth provides. Aamion is proof that the ocean does too, whether riding big barrels to the podium in the Volcom Pipeline Pro on Oahu’s North Shore, or landing a monster dog tooth tuna with spear while no one is watching. He intuits the less you say, the more people listen, and their son Given, 3, learns this first hand. The unassuming words from Given’s gravelly throat offer clues to his atypical worldview. The Goodwins drop into the bigger waves in life with clear eyes, setting up for the high line.